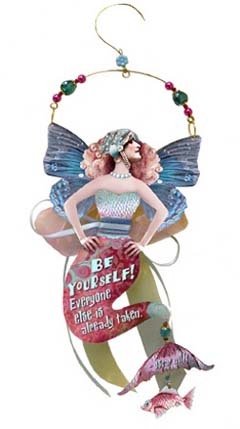 Anyway, yes, back to Laini’s Ladies, featured here today… Laini’s Ladies, technically, are a gift and stationery collection, as Laini’s site explains it, that unites her “love of color and pattern with great quotations, sparkling beads, and ribbon, to create fun and elegant lacquered ‘ladies’ for home, garden, Christmas tree, bath, and greeting cards.” Today we’re featuring some of the hanging ornaments. This page of Laini’s site will tell you the great story about how Laini’s Ladies came to be. The adornments are sold by Bottman Design, and if you visit their site, you’ll see they’ve got soy wax candles, magnets, garden stakes and ornaments, and more. Anyone do their holiday shopping early? Well, I don’t, but I’m not going to forget that site (though Eisha and I already pinky-promised we’d get each other “The Royal Tenenbaums” for Christmas. Neither one of us actually owns the movie. What a shame, but I seriously digress). 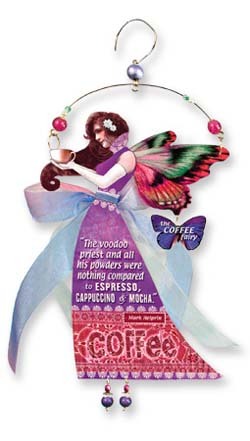 Here are some more ladies, and how truly, madly, deeply do I love the coffee one pictured above? A whole, whole lot. As many of you already know, Laini is married to freelance illustrator Jim Di Bartolo, who illustrated the cover and some interior images for Laini’s Faeries of Dreamdark: Blackbringer (Putnam Juvenile; June ’07); who will be illustrating more of her books, including FULLY illustrating Goblin Fruit; and who has a fabulous art blog where he features more of his work. Do we want to feature Jim one day soon if he’s up for it? Damn skippy we do. So, let’s hope he says yes, and—if so—look for that soon-ish. Woot! I want to learn more about this golfer anyway. Last but not least, Laini is working with the lovely and honorable Jone MacCulloch to organize the upcoming Portland Kidlitosphere conference. They’ve been working their tail-ends off, we’re sure of it. Here’s where you can read more about that. Many thanks to Laini for sharing with us today, especially having just met a major deadline. As a reminder, our 7-Kicks list is the meeting ground for listing Seven(ish) Exceptionally Fabulous, Beautiful, Interesting, Hilarious, or Otherwise Positive Noteworthy Things from the past week — whether book-related or not — that happened to you. Anyone is welcome to come list their kicks, so have at it. Aw, Laini! Yay! 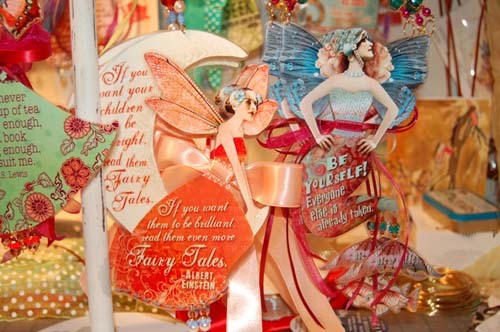 Look at those awesome fairies, why don’t you. Just lovely. 1* Haven Kimmel has a blog! It is everything I could have hoped for: bizarre, brilliant, and gut-bustingly hilarious. This is the first post I read, and Mother of God, I laughed so hard I nearly soiled myself. Many of the posts culminate in photos of what appears to be (oh god) a taxidermied monkey. She’s also got a new novel, Iodine, coming out in a couple of weeks. Between that and Breaking Dawn, my first week of August is pretty much booked. 2* I finally read Pride and Prejudice. I cannot explain why it hasn’t happened until now, but I hold each and every one of you accountable. Honestly, what is wrong with you people? Why didn’t you put this in my hands 15 years ago? It’s so funny! And oh, it’s been forever since I read anything with language that rich. Lovely. 3* I went blueberry and raspberry picking with some friends. We kept waiting to get hit by the thunderstorm we could see/hear in the distance, but it never happened. And I have a freezer full of berries. 5* And Nick and Norah’s Infinite Playlist, which, okay, I never finished the book, despite a majority vote that I should. But I bet the movie will be good. It’s got Michael Cera. I love him. Who doesn’t love him? 6* He’s also set to star in the Scott Pilgrim movie, based on a series of graphic novels that I adore, which is going to be directed by Edgar Wright (you know, Shaun of the Dead, Hot Fuzz). Woo! 7* Last, but not least: Jules and I declared our need to cut back and blog less, and you guys didn’t call us a couple of sissies. In fact, some of you are feeling the same way, which was very nice to hear. Thanks again, everyone. 2). Laini’s Ladies. 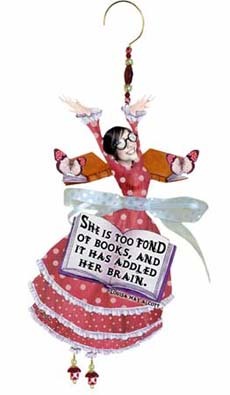 I’ve got that Louisa May Alcott addled-her-brain adornment hanging right by my desk, and I see it every day. 2½). Andrea and Mark of Just One More Book!! think we’re “brillante.” Aw, thanks, you guys! 3). Eisha’s post from yesterday. Hee hee. 4). I second the glee Eisha feels at Haven’s new blog…AND HER UPCOMING NOVEL! WOOT! again. 5). The strawberry/blueberry/yogurt/honey smoothies my husband makes. As he puts it, they’re scrumdangdiddlyumptious. 6). My wee daughters really love the music of Feist, particularly her “1234” song. I can’t tell you how many times we’ve danced around to that thing. So, this week I stumbled upon this, and they just about passed out from happiness. 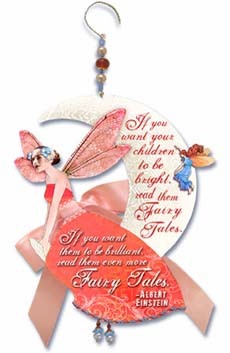 Share with the children in your life. As Entertainment Weekly put it, which is where I found this, she might just have some Muppet coding in her DNA. 7). I try not to share too many cutesy things that my children say. You have to be careful with that stuff, or you’ll sound all Bill-Cosby-kids-say-the-darndest-things and wear everyone out. But, humor me here. As I kissed my four-year-old last night and tucked her in to bed, she was all, “I love you to the top of your head” and then “I love you as far as the world” and then she wrapped it all up with “I love you as straight as your hair.” That right there is a lot of love, my friends. There are no curls in sight. My bonus kick is that my husband and I are going to see “The Dark Knight” today. But, because it was so massively sold out and we couldn’t catch an afternoon showing, we are going to see an early-morning one. And Eisha’s out of town for some of this weekend. This means we’ll catch your kicks later today, and if—by some chance—spam snags someone’s kicks, don’t worry. Eisha or I will unsnag it when we get back. So, what are your kicks this week? 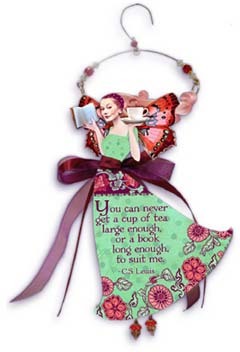 And how about those beautiful book-lovin’, quote-sharin’ ladies of Laini’s? I am loving me some ladies, in a very big way. Particularly the Einstein quote one. I’m pleased to say I own some Ladies–they’re so beautiful, aren’t they?! Laini is so incredibly talented it makes my teeth hurt–to be an artist AND a great novelist? So unfair! Oh, and she’s pretty, too! And has a talented and handsome husband! And they’re both so funny and kind! Obviously there are some horrible, hideous people out there in the world who have to balance that out. Otherwise the earth would spin off its axis. Thanks for featuring Laini! Love her! Isn’t Laini the most amazing and talented person? Big fans here at our house! Of all of her work! Yay!! You featured Laini, I love her art work and have several of the LL’s. In fact, a student brought me the one with the Einstein quote as a thank you gift this year. Thank you for mentioning the conference. I am at the coast and am hoping to have a pile of registrations when I return home today. 1-5: The coast with my family. Reallly, I hope to post later today or tomorrow. Fabulous week. 6. Cooking with my youngest granddaughter this past week. 7. Being with my other grandduaghter and doing the bumper cars last night. I am not going on the racing circuit anytime soon! Go Laini go! 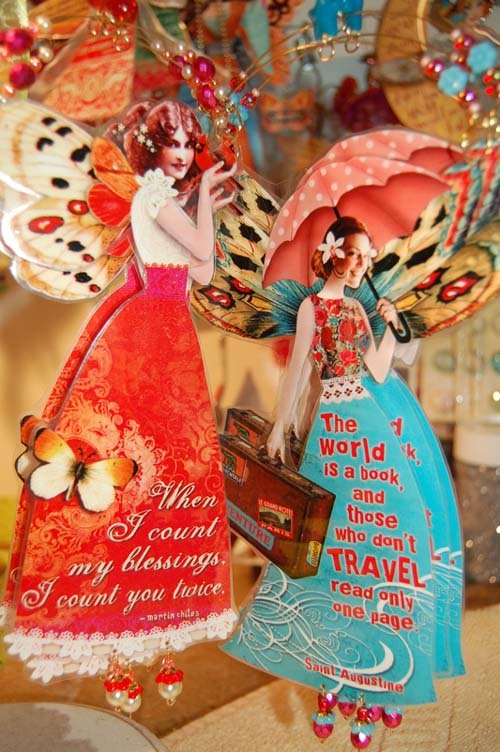 The fairies are lovely through and through – the art, the quotes, the construction. Have fun at the conference, and best wishes with your next work! eisha: There were victims of taxidermy in one of my high school classes. I tried not to look at them, especially since there was a river otter, ONE OF MY FAVORITE ANIMALS, staring at me lifelessly. I can’t stand that, the lifeless stare. Jules: Have you ever snorted hot chocolate out of your nose? IT BURNS! That Feist turn on SS is great. It earns her points in my book for being willing to recreate her hit for munchkins and education. E&J: I envy your berrilicious status. 2) Getting my new tap shoes! It’s great to see Laini, and Laini’s Ladies, featured in this week’s kicks. I have the one with the C. S. Lewis quote, and I love it. And Blackbringer was one of my favorite reads last year. I’m looking forward to Silksinger. 1. Like Jules and Eisha, I received wonderfully supportive responses from my friends, both inside and outside of the Kidlitosphere about my recent post lamenting the time needed to what I want to do with my blog. And no one called me a sissie either. Or a copy-cat, which I was (though seriously, it is interesting that so many people are struggling with this at the same time). 2. Marjorie Coughlan from PaperTigers interviewed me, and I got to talk with her about ways to encourage readers and other fun stuff. 3. Andrea and Mark from Just One More Book think that I am “brillante”, too. And I’m in such good company! 4. Our friend Miles, who we don’t get to see nearly often enough, visited us from LA this weekend. 5. I went to the BlogHer conference, where I met a number of interesting people, and had lunch with the lovely woman who recruited me earlier this year to do that Expert Q&A for PBS Parents. I did not, alas, get to meet Anne-Marie Nichols, though I heard that she was there. 6. I made delicious blueberry muffins this morning. 7. I’m reading Diamond of Darkhold, the fourth City of Ember book! Working today so short kicks — can you believe my editor is emailing back and forth with me on a SUNDAY?I can’t either, but it feels good to be getting the last of this (for the nth-millionth time) final revision put to bed. 2.) A new story popped into my head — weeks ago — and I wrote down the first two chapters and forgot about it. And found it today. And was pleasantly shocked – it looks like a story I want to read! 7.) Books to come home to, rain or shine. I really love that Einstein quote. Wish my Mom had heard that one. Oh, well. *I’ve* heard it, and now I have another good excuse to read Faeries of Dreamdark: Blackbringer , ’cause that counts, right? 2. Finishing The Underneath, by Kathi Appelt. What a wonderful book, and what exquisite writing. I promptly recommended it to several younger friends and relatives. 3. Laini’s Ladies – how lovely! 4. Reading in the hammock yesterday afternoon after running 12 miles in the morning. Life is good. 5. Reading about the Portland Kidlitosphere conference – I am thinking about attending and just soaking all the info up. Yay, Laini! I have to agree with Robin that there must be some VERY BAD people out there to balance out her supreme talented-ness. Did you read her ghost story for Sunday Scribblings? So fun. I’m feeling kicky because I’m nearing the end of my revisions. Soon I will be able to read and watch movies again and go out during the day. There was that whole wonderful retreat thing in there, too, which kept me going! I’m also feeling kicky because you’re still blogging! And Eisha, m’dear, you have officially written the best Dear John letter to an author EVER. Wow, those fairies are great! Eisha, berry picking sounds like great fun (although in books people always bump into bears). Putting aside the fact it took you all this time to get around to P&P, I’m glad you’ve discovered a new love! Jules, I’m off to make smoothies now, yum. 1. The nicest thing this week was a lovely care package from a friend in the US who had been kind enough to forward on some mascara I was buying for my sister, and included lots of yummy goodies such as spices for meat, instant grits (for other similarly clueless people this sounds like a polenta type thing, haven’t tried it yet! ), jumbo bags of m&ms and a book by James Thurber. So kind! 2. Puffins! Yesterday we visited Bempton Cliffs in Yorkshire and I saw puffins and other seabirds (such as gannets, razorbills and guillemots) for the first time! Puffins are even cuter than I was expecting. 3. Then we headed off on a puffin boat trip. The sea got quite rough (as in waves started breaking over those of us braving the “bracing” breeze on deck) so we didn’t get around under the cliffs but still saw lots of birds at flight and diving for fish. Puffins are very cute flying but gannets are gorgeous. 4. My work’s “summer BBQ” was on Friday night. It was raining and cold but fun nonetheless. I thought the sight of people huddling under umbrellas at a BBQ was so funny I took photos. 5. I won a box of chocolates in the lucky door competition! 6. My sister has bought the material for our bridesmaid dresses next year, and it sounds lovely! 7. I forgot to say in my list last week that we finally received our food waste bin! Now we get food waste collected every week that will be turned into electricity and compost. We even got kitchen caddies and biodegradable liners too! I adore Laini’s Ladies. I own a few of them and they are full of lovely goodness. So is Laini! 1. I’m loving the new spirit of your blog, gals! 2. I found a copy of a rare book from the nineteenth century that provides much needed research about the little details for my current WIP. Can you say HAPPY? 3. With the theme of cutting back, I just discovered this great video – http://www.youtube.com/watch?v=EkHTsc9PU2A – by Jason Mraz. Talented…he has quite a range. 4. Trader Joe’s Avocado Number Guacamole and Trader Joe’s Spicy, Smoky Peach Salsa mixed together with tortilla chips. 5. I’ve started to declutter and it is not as painful as I thought it would be. 6. Grilled zucchini, eggplant, peppers and onions. 7. Romeo & Juliet directed by Franco Zeffirelli. Laini makes notecards? How did I not know this? I must have some. Eisha, Jeepers, but that’s a lot of excitement, and if I had only realized that you’d never read Pride and Prejudice, I would certainly have been sending you weekly emails to encourage you to do so. Good stuff, that. Jules, I want one of those smoothies. We’re out of fresh strawberries here now, but I *do* have raspberries, blueberries, yogurt, and honey. I will try this after I post my kicks. 1. Earlier this week I went to have dinner with my mother-in-law, and she gave me my late husband’s old Atari. It still works, and it is SO COOL. 2. She also gave me a box of those old Looney Tunes Pepsi glasses, which I love. I already have quite a few, but glasses are one of those things it’s hard to have too many of, especially when they are emblazoned with animated characters I love. 3. I finished making my travel arrangements for the Kidlitosphere conference. Huzzah! 4. I went out to a Red Wings baseball game with a bunch of friends Friday night. It was my first game of the season, and it was perfect–perfect weather, perfect food. The Red Wings did lose, which was kind of a bummer, but I’m really more invested in the weather and the food and the occasional socially acceptable excuse to shout “CHARGE!” in public. 5. Continued fresh raspberries and blueberries. 7. I am also feeling especially grateful for my home this week. I really like it here. Thanks to all of you for stopping by. Reading your kicks is always kick #8 for me — or 8 and 1/2 or 9 if I’ve added babbly bonus kicks. Kelly, Robin, and Heather (and everyone else, for that matter), word to Laini’s blinding talents. How fun was it to feature her? Lots. Why do I keep talking like Chandler Bing? I dunno. Jone, so glad you’re enjoying the coast! Little Willow, I can say, without a doubt, that I’ve never snorted hot chocolate from my nose. Congrats on the tap shoes and the bread, though perhaps the order should be reversed. Bread is my favorite food. Ever. Just simply bread. Jen, yes, I saw that you were named “brillante,” too, and I also immediately thought, we’re in gooooooood company. Thanks for sharing the Paper Tigers link. I’m looking forward to reading that. TadMack, I’ve also never read Laini’s Faeries of Dreamdark, but now that I’m letting myself read whatever I want whenever I want to, no matter how old the book is, I’m adding it to my list. Congrats on your long weekend and your found story. RM, calling The Underneath “exquisite” is a good word choice. I’m still jealous of your hammock, and YOU RAN TWELVE MILES?? Whoa. I think you’d only see me doing that if, say, a fire were at my heels, but I admire those of you who do it. Sara, big ‘ol congrats on nearing the end of your revisions. Emmaco, note what I just typed to TadMack. Same goes for Pride & Prejudice. Never read it, and I plan to. 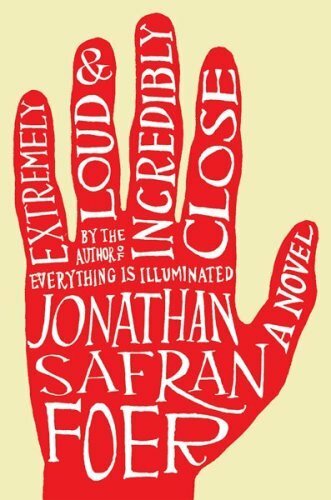 I was thinking of that the other day and then Eisha up and told me she was currently reading it, and I thought, she’s really going to think I’m copying her book choices all the time, since she just read Jonathan Safran Foer’s book, too. But mostly we’re just psychic twins when it comes to books, I think. And, Emmaco, your kick #7 is particularly awesome. Vivian, score on the rare book! And I’m glad you like the new “spirit” of our blog. That’s the best way to put it, I think. I’ve been decluttering a little, too (even some of it as a result of scaling back on blogging a bit), and it feels really good. I am turning into one of those people who wonders enough for me to do something about it anymore: Just why exactly do I have so many books? And CDs? Do I really need all these? Adrienne, your Looney Tunes Pepsi glasses sound especially great. And are you gonna post pics of the Atari after all? Love Laini’s Ladies! I’m so glad you two featured them. Thanks! Jules, I love those cutesy things your four-year-old said to you as you were putting her to sleep! Those are lines to cherish and remember. Eisha, glad you loved “Pride and Prejudice.” It’s one of my favorite books. Not too much happening in these parts except for oppressively humid weather interspersed with thunderstorms. I’ve got just two kicks for this week. 1. My husband and I celebrated our 39th wedding anniversary last night at home with champagne and lobster rolls. 2. I have finally gotten around to doing some major cleaning in my basement and library/office. I’ve got about ten bags of trash to throw out–and I’ve organized and consolidated files, etc., so things will be easier to find when I need them. It feels so good to have done this. I’d been putting off this task because it seemed overwhelming. It’s awful to be the kind of person who saves everything!!! Have emerged from home improvement stupor and turned on the computer. What a treat this feature is! 1. Seeing this Laini’s Ladies feature has triggered a BRILLIANT idea for thank you gifts for folks who travel far and wide to attend the wedding of the year next January. 5. My garage is not falling down any more. (actually did not know it was wobbly until old siding was removed.) It is now straight and strong. Hi Jules & Eisha! Thanks so much for the feature! I’m thrilled to *be here*! Thanks too for the heads up on the Haven Kimmel blog (SO FUNNY!). Eisha, I’ve been picking berries too! Just got back in fact. The blueberries had been scoured clean by the Saturday crowd, but there were plenty of raspberries and our dear Pacific Northwest marionberries. YUM! My fingers are purple. Let’s see. . . kicks. . .
1) getting back mansuscripts from my “first readers” with hearts and smiley faces all over them! 3) took my 12-year-old niece to get colored hair extensions (like streaks that can be removed) for the summer and she picked hot pink! Woo, I’ve been travelling all day, and now look at all the kicks! What great weeks everyone’ having. Kelly, Robin, Heather – hey. Thanks for sharing in the Laini-Love. Jone, you’re making me miss living near the ocean. Have fun! Little Willow, I haven’t snorted the hot chocolate through my nose either, but once I did laugh so hard I choked on the marshmallow floating on top, and then when I ran to the sink to spit it out I banged my head on the faucet. How’s that? Jen, our sister, good for you for declaring your blog independence too. I hope you figure out a balance that makes you happy. TadMack, how cool to surprise yourself. Good luck on the revisions. rmpreston, I’m with Jules here. Why would anyone run 12 miles, exactly? But the hammock part sounds good. Sara, good luck on your revisions, too. emmaco, I want someone to pick up my compost too! That’s brilliant! And I just looked up what a gannet is – so pretty! Enjoy the grits, but in case you don’t, keep in mind that instant ones aren’t nearly as good as, say, the ones my mom makes. Vivian, that’s a sweet song. And if you’re bored with decluttering your own house, I’ve got plenty for you to do here. There might be some berries in it for you. Just saying. adrienne, my husband has been known to break out the old atari at parties and such, and it continues to be awesome. I love that one where the blobs shoot the other blobs. Also, I shout “Charge” in public all the time – is that wrong? Mindy, I love your new look too! Elaine, happy anniversary! Same offer I made to Vivian goes for you. You industrious types are making me feel guilty for running around all weekend. Hey, BookMoot, I’m impressed. You sound awfully handy. Howdy, Laini! I’ve never even heard of marionberries. If I make it to Portland I’ll have to look for those. Mindy, congrats on the new blog design. I went and looked, too, and me likey. And your wee babe is half-a-year old now! Where does the time go? Elaine, happy anniversary! I need to do some filing, too. In a big way. I can see how it’ll feel freeing, like you said, if I can just get to it. Camille! Hi! I love to see folks who don’t normally leave kicks come and leave kicks. And, yes, you’ve been mighty productive. Laini, it was entirely our pleasure to do this LL’s feature. Jules, It is my goal to photograph the Atari…after I vacuum. Might be a while. Eisha, My understanding is that shouting “CHARGE” in public is perfectly okay as long as you aren’t in a movie theater. Then it’s wrong. Any time anyone shouts “CHARGE!” I think of Arsenic and Old Lace. jules: IT BURNS. I heart tap. I heart bread. I don’t eat bread while tapping. I ate FAR too many pieces of bread yesterday. My lovely computer copied and pasted half of the previous comments. Ah! Delete! Sorry! Delete! Sorry! EXTERMINATE!!! I deleted it for you, LW. I got your back. Awesome, guys. Love all the great peeks at Laini’s Ladies, and great kicks this week, too. I can’t wait for the Ember movie!